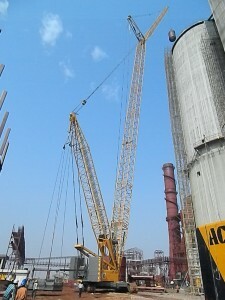 Indian firm Bhoir Group used its 300t Liebherr LR 1300 crawler crane to complete a complex lift at a cement plant in Chattisgarh, India. The crane was hoisted 8.3t with an 86m main boom, 89m luffing jib and derrick with 50t of suspended counterweight. The lift was carried out at a radius of 53m and the load was placed at a height of 118m. The rental firm said that without the LR 1300 a bigger crane would have been needed to execute the lift, thus requiring more space and causing higher costs. The Bhoir Group has four LR 1300 crawler cranes and has used them for several high-rise and heavy lift erections. The manufacturer said that it believes that the main boom and luffing jib combinations available on the LR 1300 made the crane a one of a kind when it came to work in power plants, steel plants, cement plants, petrochemical plants and all other types of erection works. The crane can be fitted with a maximum of 98m of main boom, a maximum of 113m of luffing jib and various fixed jibs including windmill fixed jibs of 7m and 8m.